Curves and a Camera: In-N-Out or Five Guys? Where's Your Burger Loyalty? In-N-Out or Five Guys? Where's Your Burger Loyalty? Today the Los Angeles Times tweeted an article about how Five Guys and In-N-Out were beating out fast food places like Burger King and McDonalds (well "Duuuuuuh!" was my thought). 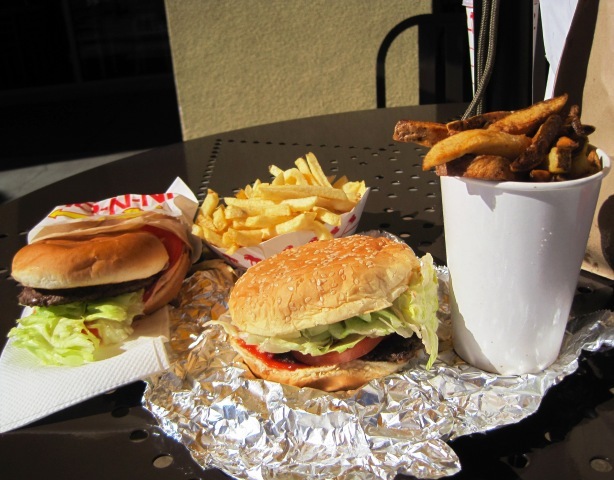 There was another article...this time comparing Five Guys and In-N-Out. "We chose this over In-N-Out," said Gueghlein, chowing down with family members at the Five Guys in Valencia that opened in January. She liked the fresh, flavorful burgers and hand-cut fries at Five Guys — as well as the novelty of trying something new. "It's the fourth time we've been here since they opened." Now, I am a Southern California girl. There's no denying that. Doesn't matter where I move to or how long I'm there, I was born and raised on the San Diego beaches and eating In-N-Out. However, two years ago I moved out of California and away from In-N-Out. I first went to Five Guys when visiting one of my BFFs in Seattle. OMG! It was so yummy. I loved that they were making fresh patties visible to the diners. I loved that their fries were thicker cut and had the skin still on them. I love that I can get a "Cheese Veggie Sandwich" (a burger with no meat for those of you who haven't been to a Five Guys) on days when I'm not feeling like meat. Mmmmm. Then a few months back they opened a location about 15 minutes from my house. Yippee! I took my mother there as soon as they opened - she moved to California in the early 60s as a child and grew up on In-N-Out. First words out of her mouth after trying a Five Guys Burger "Oh my. This is better than In-N-Out. And I'm a California girl!" Haha. We agree the one downside of Five Guys is their buns. They don't hold up to the heft of the burger and toppings (but this is also a complaint with In-N-Out) - they need something with more umph. 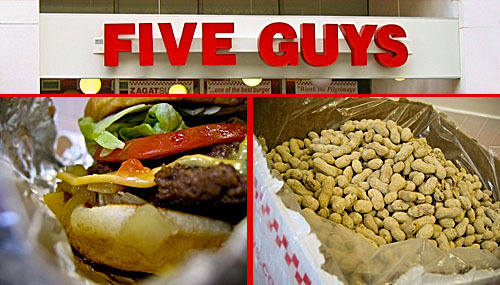 Have you been to a Five-Guys? Have you been to an In-N-Out? Which do you prefer? 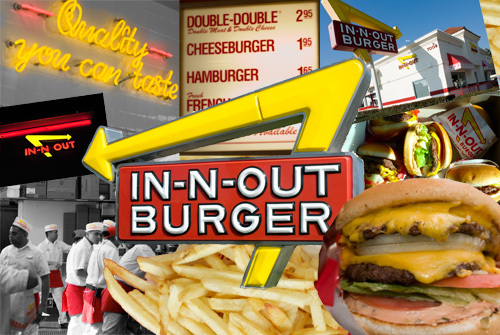 I've been to three of what are considered the "top" burger chains in the country - In-n-out, Five Guys and Fatburger. Five Guys blows the other two out of the water, for sure! Never been to a Fatburger. There was one around the corner from me when I was living in San Diego - just never went. Hm. I'll have to try and find one.